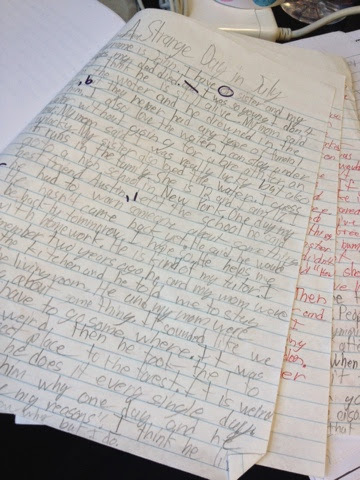 I love to use stories as a starting point for writing pieces in class. My colleague introduced me to The Mysteries of Harris Burdick by Chris Van Allsburg a few years back and I am hooked. The book is set up chronicling the mystery of this writer, Harris Burdick, who visited a publishing company with these interesting pictures, titles, and a line from the story. The kids are so intrigued by the illustrations and the text that goes along with each and they can't wait to pick a story and write their own. We begin by analyzing the pictures. We have large laminated copies of each picture so the students can get an upclose view. 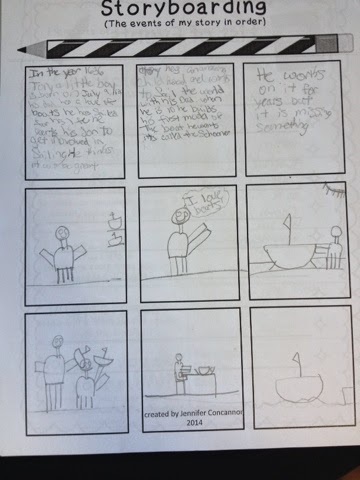 They pick three pictures, write the title, what they notice, and what they can infer from the picture. Then eventually they narrow it down to the one they want to write about and begin the writing process. This year I created a few organizers to help my students write their pieces. This product is available on my TPT store. 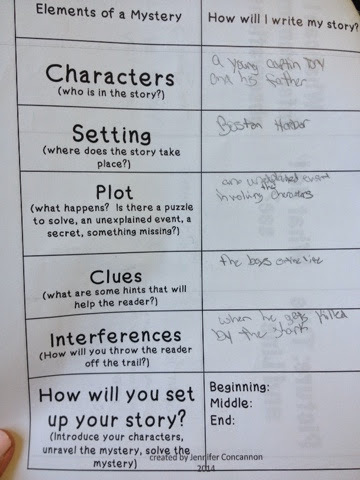 They begin by writing out the elements to their mystery. Then they move on to make a list of their major events in the story. Finally, they take the events of the story, put them in order, and add more detail on their storyboards. I know this doesn't look like a ton of detail, but sometimes a picture is worth 1,000 words...right?? From here we move on to the actual writing. Yes, it's a long process! However, the students really look forward to working on their pieces. They end up writing page upon page upon page and so on! I have them check their own papers and then I conference with each student individually. They will then edit and revise and then peer edit again! This project is really a labor of love. We also do fishbowl editing, which is when one student reads their paper to the whole class twice. 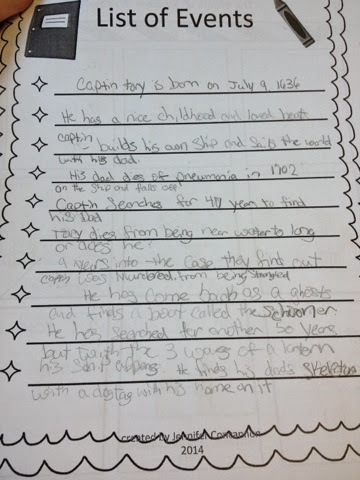 The first time their peers just listen to the story and the second time through they can jot down comments. The comments can be positive observations or constructive criticism. Yes this project can be a lot of work as it was in my class. However, it does not need to be that intensive. My students really got into it so we spent more time working on these pieces than I normally would have, but the results were fantastic! Click below to be taken to the Amazon.com listing for the book. I also am linking the Chronicles of Harris Burdick which is a great resource! Famous authors write their own endings to the stories...however, some of the stories are geared more towards adults just FYI.